The road project on the 500 and 600 blocks of Walnut Street has been completed – or has it? According to residents of the two blocks, the work has largely been done, but all is not well. Several came forward at Monday’s borough council meeting to lodge complaints ranging from cracked sidewalks to improperly placed drain lines to flooded basements. But the overarching concern was about oversight - or lack thereof. Nick Meley, a resident of the 600 block, told council that he and at least eight other neighbors have gotten a significant amount of water in their basements from recent rains. He attributes the water to improperly installed drain lines and sidewalks, since basements on the block were typically dry after rain previously. He also said a longtime stormwater issue that was never corrected has added to the problem. Meley explained that drain grates at Sixth and Walnut exacerbate the stormwater problem on his block, because they’re constantly clogged. As a result, gutters are overwhelmed by waves of water gushing down the street during a heavy rainfall - water that ends up on the sidewalks. And now with the purported completion of the road project, the water ends up in residents’ basements. He said the drain grates need to be cleaned daily to help alleviate the problem, because leaves clog the grates in the fall, and trash clogs them at other times. Meley said his block functions as an “above-ground storm sewer due to the stormwater flowing onto the sidewalks. 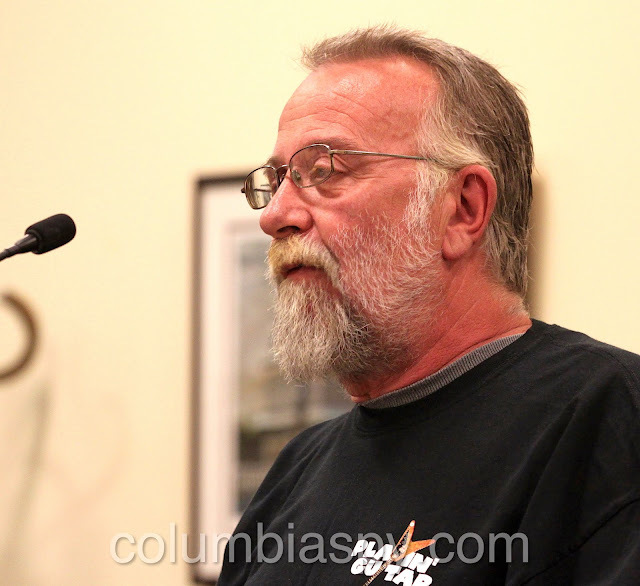 He told council the recent road project proceeded without the problem being addressed. “Someone should have taken care of the problem before the project started,” he said. He added that when he previously pointed out the problem, he was told that it’s too expensive a fix or "there’s nothing that can be done about it." “Prior to even the project starting, everybody knew that this was a problem," Meley said. "No one addressed it.” He characterized the failure as an example of “incompetence and short-sightedness.” Meley said he never saw the director of public works on-site while the project was underway and that he believes the director is incompetent for not recommending that the borough’s engineering firm, C.S. Davidson, address the stormwater problem. Meley also said neighbors on the two blocks have complained about cracks in the sidewalks inches from control joints. “So much for control,” he said. And there are other problems. Meley said he observed contractors using "T" fittings instead of couplings on drain lines and closing off the third leg with silver tape. He also noted contractors taping off drain box outlets with silver tape instead of PVC caps and covering everything with concrete. “They were doing it the whole time,” he said. Meley noted a negative pitch for some of the drain lines, meaning they run backwards – towards the house instead of towards the curb. He also said the lines run through the curbing at different heights – some are high, some are low. “One of them’s got to be wrong. They can’t all be right,” he said. Adding to the list of complaints is a sinkhole recently discovered on the block, which had apparently been undermining for years. Meley said white stringy mold was found on the walls of an adjacent basement there. He said someone obviously missed that during a code inspection. 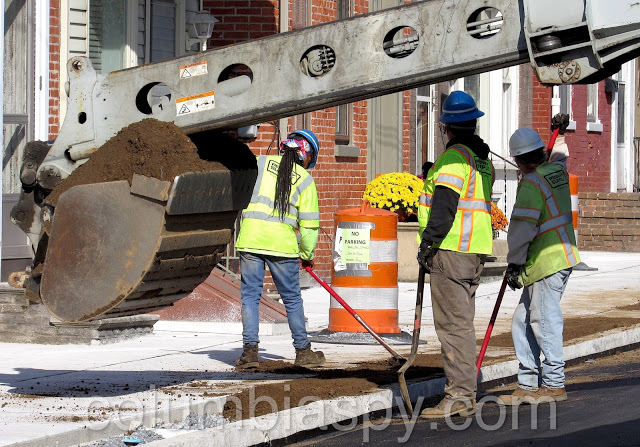 Pennsy Supply workers fill in the beauty strips with dirt on the 600 block of Walnut Street. Meley also noted a problem with “beauty strips” installed along the sidewalks. He said that the strips, which are filled with dirt, will be mud and weeds next summer due to the fact that, of the 47 properties on his block, only 11 are owner-occupied. The rest are rentals. He believes that not many residents will maintain the strips. 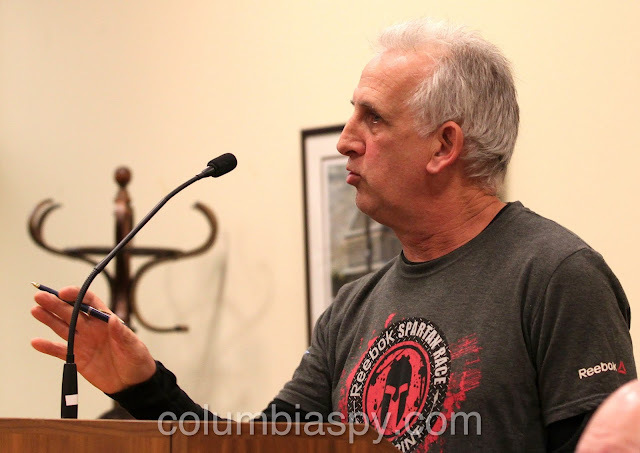 Councillor Cleon Berntheizel concurred with Meley’s opinion, noting that some properties on the block don’t have a backyard and residents therefore probably wouldn't have a lawn mower to mow the strips. Berntheizel said the strips were filled with dirt because the borough receives credits under a stormwater management program. He said the idea of adding the dirt was originally devised with good intentions. Borough manager Rebecca Denlinger told those present that the borough engineer has been out to the site several times over the past few weeks. She said the beauty strip on the north side should be concreted in. Denlinger also said the stormwater improvement program is something the borough is looking at as part of its capital improvement program. Certain streets will be looked at and prioritized for reconstruction and in the process, stormwater management issues will be addressed. Resident Frank Doutrich noted that height of the crown on the street causes water to run over to the curbs. Doutrich questioned the height of the curbing and whether it was installed according to borough code. “Somebody needs to be on top of these people and see that they’re doing it right,” he said. Gerald Hawn, owner of River Street Restoration, owns a building on the corner of Fifth and Walnut and has had a share of project-related issues on his block. 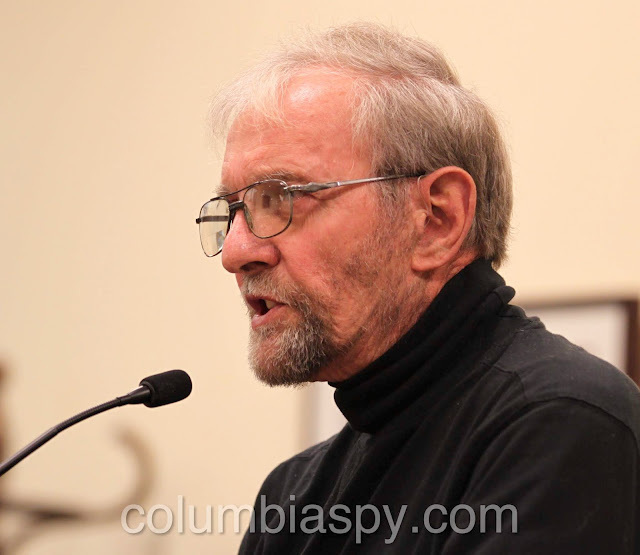 “There are problems with that whole block,” Hawn said, echoing many of Meley’s points. He noted that at the October borough council meeting, he told council that the drain outlets in the curb have different heights; some are high and some are low. He said nothing has not changed since then, also noting that the lines are still draining in the wrong direction. He anticipates more problems in the future. “We haven’t begun to see the problems we’re going to have on that street,” he said. Like Meley, Hawn noted that the concrete sidewalks along his property have already cracked two inches away from an expansion joint. “I would think our persons in public works would know exactly what’s going on,” Hawn said. Due to the cracking, he wants to see testing results for various aspects of the job.“I want to know all the tests that Mr. Graham [Highway Department Manager Jake Graham] did on my property and on that 500 block," Hawn said. He maintains that a slurry test should have been done on the concrete prior to pouring and believes it was not done. Hawn added that rebar was supposed to have been installed at various places along the sidewalk and that he didn’t see this being done. Adding insult to injury, Hawn also told council that the contractor’s work crew collectively gave him the finger because he was checking their work. According to the minutes of the April 17, 2018 Public Works & Property meeting, the Walnut Street project - at a cost of $439,910.12 - was awarded from the bond issue to Pennsy Supply, Inc., subject to review and approval by the borough solicitor. If this was down at the river park, this would be fixed right away!! The borough exchanged one problem for another and the residents got the short end of the stick. A smoother ride in exchange for water in the basement. Not a good deal. If the property values aren't already low enough, when potential buyers become aware about water in the basement it's going to drop the value even more. If I had a choice, which they didn't, I'd pick the rough road over a wet basement. first i'd like to say that EVERY PROPERTY IN THIS BORO THAT HAS A STORM SEWER DRAIN ON IT, IN IT OR NEAR IT.....SHOULD be sure it's ALWAYS clear of debris! I see the Highway Dept doing this all over town but peoples trash, pulled weeds, etc continuously block, clog the storm sewer drains all around town. When I lived close to one, for like 30 years, I ALWAYS made sure it was cleared of debris. When we have SO many slumlords and irresponsible property managers and tenants...this is the result. They don't do anything. Sorry you're having this issue, but i'm sure it will all get figured out. if borough workers really worked in town instead of the money pit it would not be a issue. EXPAND THE MONEY PIT and get rid of the sewer plant money , get this town back to the small poverty town it is with the leadership it has, the town needs help not the money pit, and experienced manager would see that. School makes top 2 in students Not showing up for school , what happened to officers picking the kids up and taking to school and fining the parent? MORE FUEL TO GO ONLINE and get rid of the buildings and dead wood there. Wow that didn't happen in a week , who is inspecting the job from the borough?? Borough manager??? What is up with the GARAGE!! People need to know more details on the tax break for the Hotel! !Also McGinness air port! !These are the BIG ISSUES here! !